Despite the media focus on President Obama’s announcement of troop withdrawals this year and next, Obama’s speech says far less about the administration’s Afghanistan strategy than three other notable (and largely overlooked) recent developments. First, over the weekend, Secretary Gates acknowledged that the U.S. is in preliminary talks with members of the Taliban in an attempt to effect political reconciliation. On the same day, Ambassador Eikenberry leveled perhaps the most forceful U.S. criticism of President Karzai yet, rebuking him for calling into question the motives of American forces. Finally, high-ranking Obama administration officials claimed major successes against Al Qaeda, arguing that they fulfilled the goals of the president’s troop “surge.” These three developments signal a major strategic reevaluation of the Afghan conflict. Together, they imply an acknowledgment of an important truth that has for too long been resisted: With the military conflict against anti-government forces still essentially a stalemate, the primary U.S. role should be to facilitate political compromise. Critics of a military-first approach to Afghanistan have long advocated power-sharing negotiations. 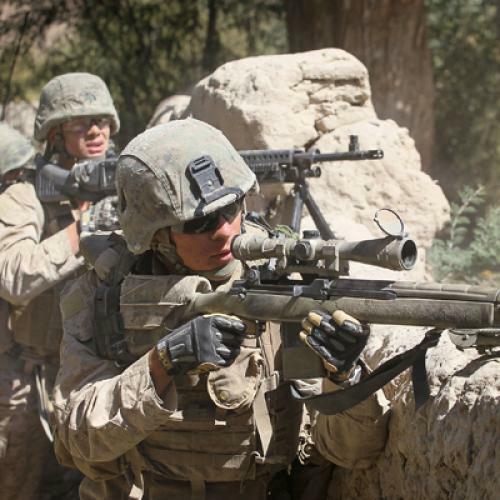 After achieving the major aims of the invasion (namely, overthrowing the Taliban and decimating Al Qaeda), the U.S. has been fighting a war in search of a strategy. That void was filled by a tactic, counter-insurgency, ostensibly aimed at eliminating any armed opposition to the central government—but the task has proven virtually impossible to achieve. Indeed, according to proponents of a military solution, victory is perpetually just months away: Nearly two years ago, General Stanley McChrystal’s report declared that “the short-term fight will be decisive”; nine months later, national security pundit Michael O’Hanlon insisted we were “enter[ing] into perhaps the most crucial six months of the entire war”; and just three months ago, Defense Secretary Robert Gates identified this spring as a potentially decisive period. With an elusive military solution always just over the horizon, last weekend’s news of political negotiations with the Taliban comes as a particular relief. Political talks, while not easy, are the only viable solution, and international institutions and regional partners must be included. The goal should be to engage anti-government nationalists, splitting them from the fighters with whom there is no chance of negotiating; offering disaffected militants the opportunity to participate in government, while distasteful, is the best way forward. To the extent that anti-government fighters are willing engage in politics—as many Sunni insurgents ultimately did in Iraq—they should be included in negotiations and, for those with a legitimate constituency, involved in power-sharing agreements. The Karzai government, of course, is an additional and glaring motivation for this change in strategy. Relations between the U.S. and Afghanistan have always been uncertain and wary at best, but recently the bond has frayed in public and dramatic fashion. While U.S. officials have long tolerated or ignored criticism from President Karzai, the comments by Ambassador Eikenberry are a reminder that Afghanistan lacks one of the most important requirements for fighting an insurgency: a legitimate and reliable central government. As General Petraeus’s vaunted Counterinsurgency Field Manual explains, “Success in counterinsurgency (COIN) operations requires establishing a legitimate government supported by the people and able to address the fundamental causes that insurgents use to gain support.” Eikenberry’s criticism over the weekend, which was more candid and public than any previous critique, serves as a reminder that counter-insurgency is virtually impossible with an uncooperative and malfeasant central government. Counter-insurgency proponents will have a hard time continuing to advocate for it if they are honest about the need for a legitimate governmental partner in successful COIN operations. Finally, the weekend’s third major story, wherein anonymous officials declared Al Qaeda “crippled” and “paralyzed” in The New York Times, indicates that the administration seems to understand the unlikely prospects for COIN success. More notably, and audaciously, the unnamed officials claimed that fighting Al Qaeda “was the main reason Mr. Obama agreed to deploy 30,000 more troops last year.” This assertion must come as a shock to General McChrystal, Secretary Gates, and everyone else who remembers a counter-terrorism strategy focused on Al Qaeda losing out to an anti-Taliban counter-insurgency policy spearheaded by a surge of more than 33,000 troops. Indeed, while the anonymous officials go on to mention anti-Taliban efforts, there is no mention in the Times piece of the retroactive goalpost-shifting contained within their statements. This framing both distracts from the previous COIN focus, which is proving untenable, and takes credit for a victory over Al Qaeda that has been evident since at least 2009, when National Security Advisor General James Jones put the number of Al Qaeda militants in Afghanistan at “fewer than a hundred.” With the strategic aims retroactively modified, there is no contradiction in negotiation with anti-government forces, while potential failure is refashioned as success. The attention to troop withdrawal numbers—whether too few or too many, too soon or overdue—overlooks this evidence of a strategic shift. Political discussions, coupled with a focus on counter-terrorism and an acknowledgment that the Karzai administration is not the sum total of potential Afghan governance, are this week’s important news. These developments are all belated, but they are also significant and encouraging. Of the recent signals, political negotiations are by far the most important; the U.S. should do all it can to facilitate power sharing, which is the natural and inevitable outgrowth of a military stalemate. Taken together, these developments are constructive both in and of themselves and as indicators of President Obama’s evolving position on the conflict. After many years of little change, our Afghanistan strategy finally appears to be shifting fundamentally—and in the right direction. A.J. Rossmiller is a fellow at the National Security Network, a former intelligence officer with the Defense Intelligence Agency, and the author of Still Broken: A Recruit’s Inside Account of Intelligence Failures, from Baghdad to the Pentagon.